Today's mission is to declutter bookcases and bookshelves throughout your home, of books or whatever else you have stored on them. 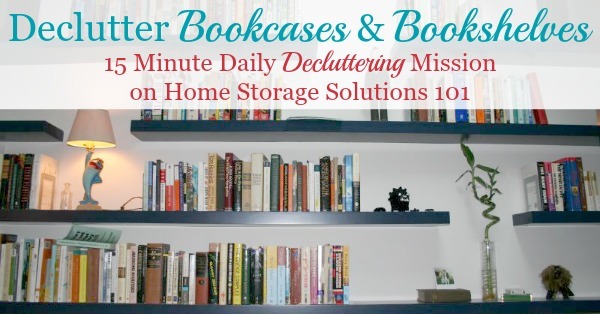 This mission is designed to be done while working on the Organize Books Challenge here on the site, which is one of the 52 Week Organized Home Challenges. Of course, this task can be done at any time, whenever you feel it is necessary in your home. 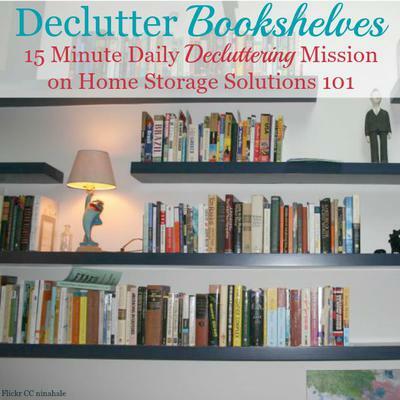 We've been working on decluttering books here on the site for a few days, and several days of the Declutter 365 missions are devoted to this task. 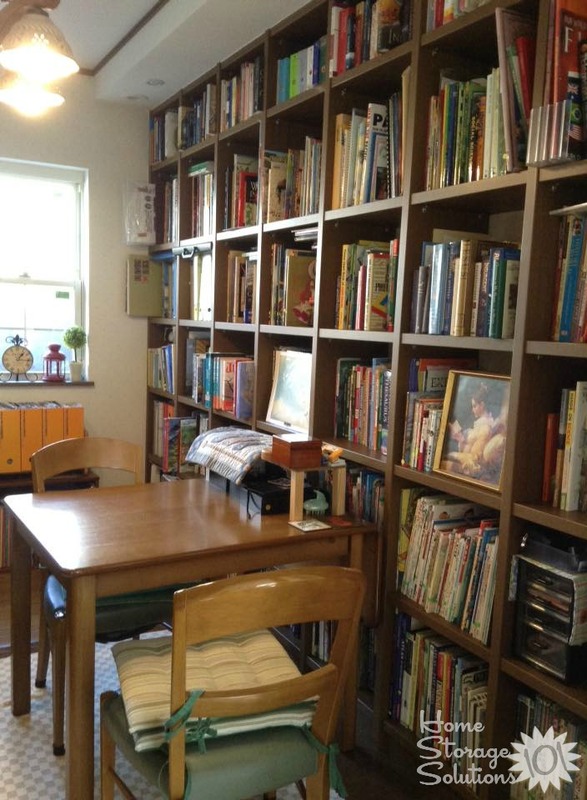 Yesterday I provided you with 5 questions to ask yourself when decluttering books to help you identify which books you should keep versus those to get rid of. You should use those questions again today when dealing with shelves and bookcases. Depending on the number of bookcases you've got (I know in our house we've got a lot of them!) this task will take you more than 15 minutes. That's OK! Instead, do this task one shelf at a time, 15 minutes at a time, and keep going, stopping when necessary and restarting when you can, until you go through all your shelves. get rid of more, you can do another decluttering pass through them. Keep only the amount of books that will fit comfortably on your shelves, with a little bit of room to add or remove books easily. Don't leave stacks of books without a home, that won't fit on the shelves. Either you'll need to find a different place to store those books, or have less books total. In addition, I'm assuming that most of the items on your bookshelves or bookcases are, in fact, books. However, I do realize that you may have decorative items, or other items you want to display. If that's the case, make sure to spend time focusing on these items as well, deciding what you'll keep versus get rid of. Remember, these are the types of items you have to dust, a lot, so if you don't want to dust it, perhaps it's not worth you keeping! Also, as you clear off your bookshelves, at least temporarily while working on this mission, it's a good opportunity to dust the shelves well, and perhaps the outsides of the books themselves, to keep everything in good condition. Scroll below for some photos from readers who've already done this mission to give you some inspiration, and get you motivated to tackle this task for yourself. 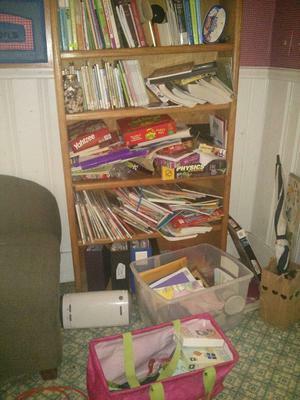 Stephanie sent in these photos of her recent book decluttering project. She had more books than would fit on her bookshelf, and winnowed it down to a smaller number so everything fit onto the shelves and also straightened up the books. Below is another set of photos, from a reader, Thelma, who also worked on this mission. She did a great job too! 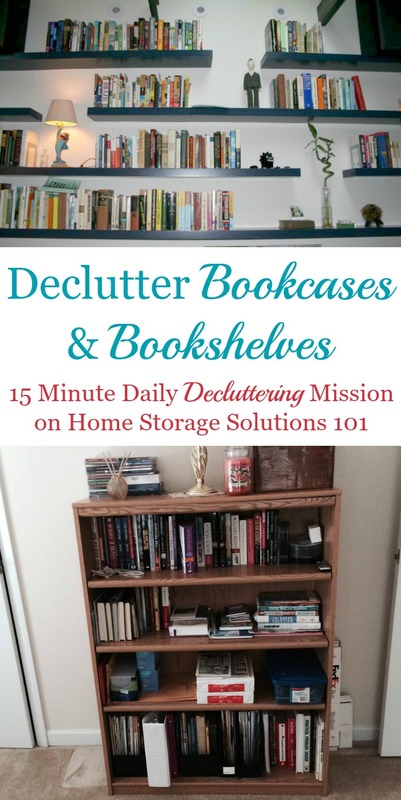 Are You Ready To Get Rid Of Your Bookcase Clutter? This mission can make a real difference in your home. Here's a couple more photos sent in by readers, to show you what they accomplished. The photo above is from a reader, Kathryn. 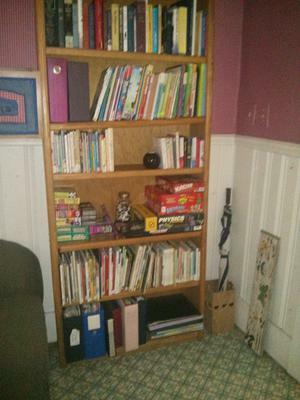 She said, "Bookshelf in our family room, but our family room doubles as our home office. Not terribly beautiful and definitely not magazine material but it works for us." I think it looks great Kathryn! You can get more ideas for organizing your home office here. This photo was sent in by Aileen. She said, "I have been putting off this job for months! 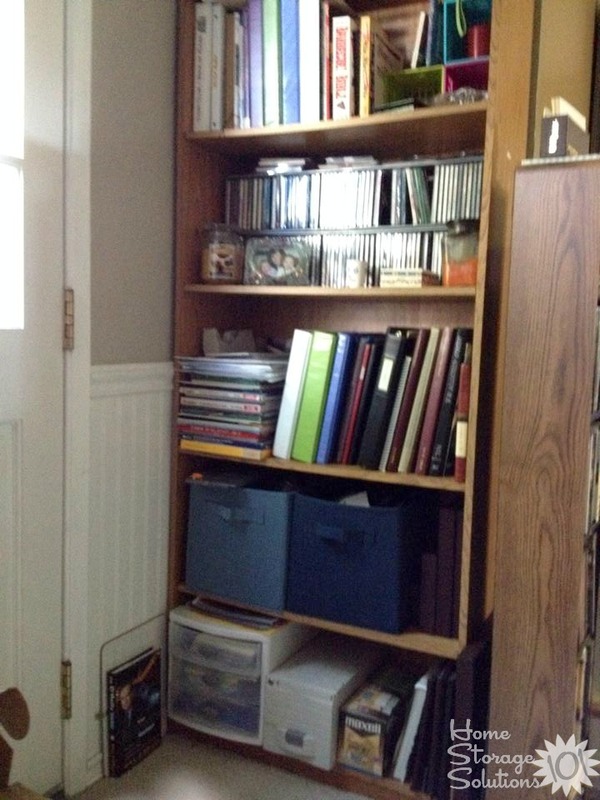 It seemed like the shelves were overflowing (they are always overflowing) and I needed to create an office study space for my husband who had been using the guest room, so he gave me a nudge with great finality, and I did it! I gave my husband a cubicle for his stationery and moved a study table in for him to use. Books are neatened up, had to double up some rows of books to make room, but they are pretty organized by category and theme, so I feel I did a pretty good job, even if I say so myself. And it took only about an hour to do it all. Great job Aileen! You did a wonderful job! 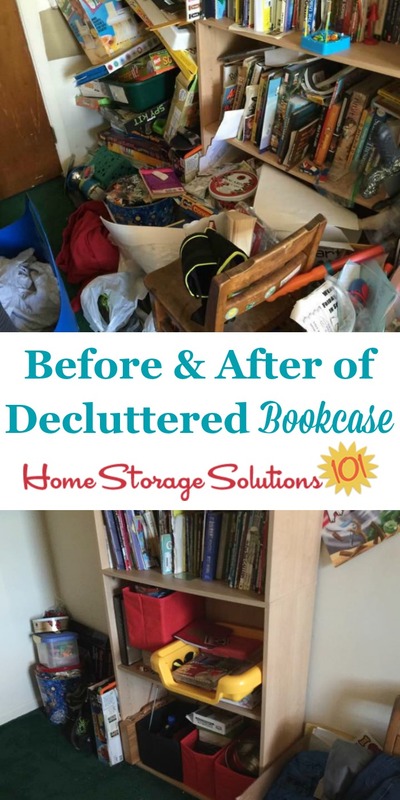 I hope seeing these pictures has inspired you to get rid of the clutter from your bookcases and bookshelves.